On Tour is a 20 minute route-building, roll-and-write board game with large, premium components. One to four (12+, with additional maps) players share dice rolls and cards to try to visit as many states as possible as they schedule a 100-day tour across the United States for their band. In On Tour, players compete to take their band to as many states as possible. You'll be writing a number in each state to book it for that date on your 100-day tour. Each turn, dice determine which numbers you write and cards restrict where you can write. Players write simultaneously on their own maps, all using the same dice rolls and cards flips. Everyone is getting the same inputs, but how you choose to deal with them will determine your success. Each turn, dice determine which numbers you write and cards restrict where you can write. Players write simultaneously on their own maps, all using the same dice rolls and cards flips. Everyone is getting the same inputs, but how you choose to deal with them will determine your success. There are also wilds, opportunities for bonus points, and a variable setup phase to make every game different. Watch the Man vs Meeple 5 min video to learn all the rules. It is a deceptively deep game. The rules are straight forward, and the choices might seem easy at first. But by mid-game you'll find yourself in a pickle if you don't do some careful planning. Traditionally roll-and-write games have been lighter games, but On Tour is a bit heavier. With any game there is a choice to be made. We could have made this game very small, with a pad of paper and golf pencils. We decided to go the opposite route, with the best graphics and components we could get. I wanted On Tour to bring component quality that matches the gameplay. One of my favorite things about On Tour (this is my favorite thing, it can also be your favorite thing if you want, or you can pick something else), is that you can play with any number of people! Mano a mano against your spouse. By yourself, to pass the time while you are home sick with Mono. With six people at game night when someone says, "Did anybody bring a game that plays six?" With all 35 of your dad's weird relatives at Thanksgiving dinner. You could even try to get a few thousand people together and set a world record. Just make sure you have a map for everyone. The game ships with 4 maps, and 4 dry erase markers. 12 will fit in the box. If you want additional maps and dry erase markers, they are $3.79 each (as in $3.79 gets you 1 map and 1 marker). Free shipping. I mean, seriously. We're going to put them in the same box. I don't think we need to charge for that. COMPONENTS What's in the box? Each player board in On Tour has unique art, each representing a different genre of music: Rock, Jazz, Country and Hip-Hop. These are big (15.2" x 9.8" / 38.5 x 25 cm) tri-panel boards, with tape reinforced folds. What's more fun than dice? 10-sided dice. What's more fun than 10-sided dice? Giant 10-sided dice. These dice are hand fillers. 1 3/8" across. They are fun to roll, and easy to read from across the table. 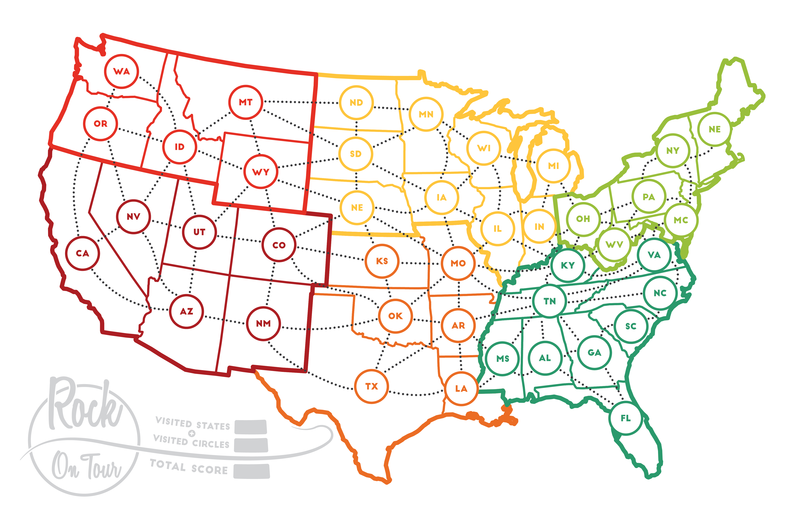 You can write your number in any state in the region on the card, but if you write your number in the exact state listed, you get to circle that number. Circled states in your route are worth double points at the end of the game. Games are great. New games are great. Learning games from the rules is a pain. We're trying to improve this situation. We used tons of giant pictures because it is easier to look at a picture than reading a thousand words. Rahdo and Jen did a special live "Run Through" of On Tour. You can play the game with them. Print this low-ink version of the map. Then watch the video above to play the game with them. Over 100 people played along live. Through the magic of tape delay, you can join them now. Rahdo and Jen will roll the dice and flip the cards. You mark your route on the map you printed and see if you can beat their scores. On Tour is a fun roll and write game.